Wellness for the World: Why Aqua Gear? Aqua Gear® Water Filtration has been designing world proven products for over 15 years. We are dedicated to protecting people from the threat of water-borne illness. Whether you’re volunteering in the developing world, preparing your family emergency kit, looking to filter your local tap water at the gym, Aqua Gear creates water filtration products to fit your life. Aqua Gear® products have been EPA tested and approved in both field and laboratory tests around the world, including the countries: United States, Mexico, Brazil, Argentina, Peru, South Africa, United Kingdom, Korea, China, Japan, Malaysia, & Vietnam. 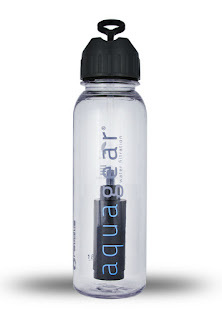 AquaGear® was founded by aerospace engineers with the goal of protecting people from waterborne illness. Aqua Gear has grown into the trusted brand for disaster preparedness and international travel. Aqua Gear’s line of water filtration products addresses all areas of water contamination: Aesthetic, Chemical, Microbiological, Heavy Metals, & Radiological. In each category, Aqua Gear® products meet and exceed requirements for testing protocols, offering the highest reduction per contaminant in the industry. Making up the majority of your total body mass, water is essential to many of the body’s most important functions. These include everything from the removal of toxins and waste from internal organs to blood-flow, cellular reproduction, and digestive function. Staying appropriately hydrated allows your body to function in these capacities while reducing the stress and fatigue accompanying a dehydrated system. Both municipally treated tap water supplies and untreated fresh water lakes and streams are full of contaminants ranging from industrial and agricultural pollutants to microbiological matter like giardia and cryptosporidium. The Aqua Gear product line removes these pollutants from your water supplies so that your body doesn’t have to! By decreasing the toxicity of your water, we are increasing your body’s ability to properly function, warding off sickness and harmful bodily stress, and improving intercellular function and longevity. All Aqua Gear products are produced using certified BPA-Free materials. The human body can survive for weeks without food, but only a few days without water. Without water cells cannot grow, reproduce or survive, and the entire organism dies. For the purposes of survival, consuming contaminated water can actually increase the speed of dehydration due to potential of sickness and dysentery. In any disaster situation, it is essential to understand how clean water can be secured for you, your family, and your community. In the event of a natural disaster, clean water is often the first resource that becomes scarce. Contaminated water supplies offer the greatest threat to any person, family, or community trying to survive in the aftermath of a natural disaster. Public water supplies can often be contaminated, leaving great risk to a person who needs to hydrate from an untreated water source. Our water purification products offer a long-lasting insurance policy against waterborne illness so that the user can focus on securing the second and third most important objectives in disaster preparedness 101: food and shelter. The Aqua Gear product line can be stored indefinitely if properly cared for and kept in a dry place. Over 60 million plastic bottles are discarded to landfills daily in the United States alone. This is not to mention the actual resource cost used to manufacture and transport these plastic bottles from overseas. Plastic, which is not bio-degradable, can take up to 1000 years before it disintegrates into a particulate plastic matter. In this stage of decomposition, plastic can mix with soil or water where it further breaks down and increases in toxicity. It is then a danger to local wildlife that may unconsciously consume it, increasing in concentration as it passes up the food chain through a process referred to as biomagnification. Aqua Gear encourages each of its customers to send any used water filters to its recycling facilities. Even though each Aqua Gear water filter can replace up to 800 plastic bottles, we do not want to see our water filters end up in landfills! How do I hold my bottle when I am drinking from the filter? Hold the bottle upright (vertical), just like when you are drinking out of a straw in a glass. Keep in mind that the filter sits at the bottom of the bottle when attached to the stem. Will hot liquids damage my water filter? Yes. Hot water will damage the filter. Warm water will not cause any harm. How do I use my extension straw? In order to use your straw extension, just unthread your filter from the cap assembly and thread on the straw extension. It is that easy! Do I need to flush or soak my filter before use? No. All Revolve Water Filters are primed for use in manufacturing. They always arrive ready-to-go! How often do I have to replace the filter? As you reach the filtration capacity of your water filter, the water output, or flow, will gradually decrease and will become more difficult to drink thru. When this happens, it is time to replace your filter. Do I need to clean my water filter? No, there is no need to clean your filter. However, if you would like to wash your cap assembly, be sure to unscrew your filter from the cap assembly stem. We recommend hand-washing all plastic parts using warm, soapy water. No soap, baking soda, vinegar, or hot water should be applied to the filter itself. Is there anything particular I should do before I store my filter for a period of time? Your water filter can be stored indefinitely once it is thoroughly dried out. Be sure to shake out any excess water, and allow to dry overnight for 2-3 days. Great point Carrie and an awesome option if needed. One of the challenges with boiling though is the fact that this destroys nutrients within the water. With this said, if anyone questions the safety of their water and you do not have an optimal source to filter, boiling is an option to use. Thank you, this is a good review for others.